There are only two types of people that hate year-end performance reviews » Mark Donovan & Associates Ltd. I was working with a client recently on improving staff retention and engagement. One of the managers I was working with told me that when he is having the yearly performance reviews with his team, they usually descend into a ‘blame game’ with no meaningful outputs. If we only meet our staff, once or twice per year, we are forced to drop our criticisms on them all at once, like a bomb! 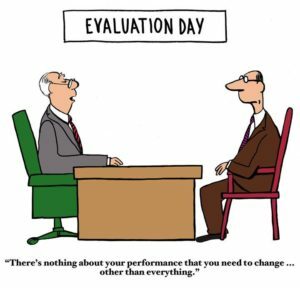 I have found that there are only two types of people that hate year-end performance reviews, those that are giving them and those that are receiving them! What do we need to do to change to make these more effective? To deal with people effectively, we must study their wants, their needs and what will engage them on an individual basis. We can’t do this meeting our staff every 6 or 12 months! What’s going well since we last met? What’s not going well since we last met? What do you see as your key priorities over the next i.e. month? What obstacles do you see in meeting these and how can I help you? Action point: schedule in one to one’s for your key people over the next few weeks and try out my informal structured one to one process above. Let me know how you get on.